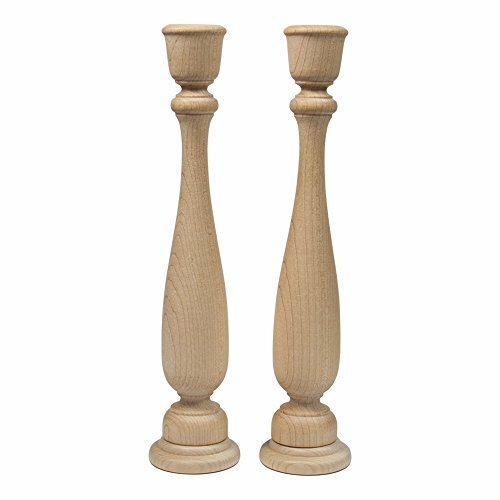 Natural wooden candle stick holders are unfinished and ready to be personalized for your next crafting project. These natural wooden candle sticks are perfect for wedding and holiday table centerpieces. Our wooden candlestick holders can be used as a cupcake pedestal, stand or create a DIY dessert tiered tower. Add a glass jar or canister to the top of our wood candlestick pillars and display as decoration, vanity storage or fill it with candy. Unfinished candle stick holders can be painted to match wedding colors to display during the reception or ceremony. Create beautiful decorative pieces with our natural unfinished wooden candle stick holders for your home or for your next special occasion. 11 inch candle holder is made of natural solid hardwood. Create beautiful decorative pieces with our natural unfinished wooden candle stick holders for your home or next special occasion. Natural unfinished wooden candle holders are perfect addition to centerpieces or placed on the fireplace mantle. Unfinished wooden candle holders are great canvas for crafters to paint, stain or embellish. If you have any questions about this product by Craftparts Direct, contact us by completing and submitting the form below. If you are looking for a specif part number, please include it with your message.